Bjorn Vang-Mathisen at Ocean Independence tells me he’s closed on his listing for sale, the 25m motor yacht Noon Tease with Inwards Marine acting for the buyer. Noon Tease was built by Italian yard Cantieri Navali Santa Margarita to ABS class and delivered in 1994 as an Alalunga model with a refit in 2009. An interior by Tommaso Spadolini features a saloon forward on the main deck offering intimate spaces for relaxation along with a retractable plasma television screen and Bose surround sound system. Sliding doors mean that the saloon can be integrated into the master suite, creating a vast space. Behind the bridge there is a sun deck with a sheltered dining area for al fresco entertaining. Six guests are accommodated in three staterooms. The full beam master suite is on the main deck while the VIP stateroom and a twin cabin are situated below deck. 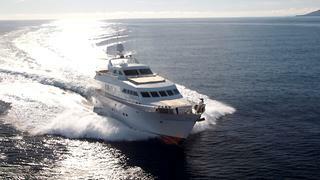 All staterooms offer flat screen televisions, Bose surround sound systems and full en suite bathroom facilities. Twin Deutz 1,400hp engines give Noon Tease a range of 1,800 nautical miles and she was asking €500,000.